Cloudy skies. A stray shower or thunderstorm is possible. Low around 55F. Winds S at 10 to 20 mph..
Cloudy skies. A stray shower or thunderstorm is possible. Low around 55F. Winds S at 10 to 20 mph. Gov. Scott Walker speaks at a Freight Rail conference in Madison Wednesday. "I like to say thanks to God and the glaciers" for leaving behind the right kind of sand in Wisconsin, he said. Rayola Dougher, senior economic advisor at the American Petroleum Institute, speaks at a Freight Rail conference Wednesday. "I honestly think the sky is the limit for you guys" when it comes to frac sand mining, she said. 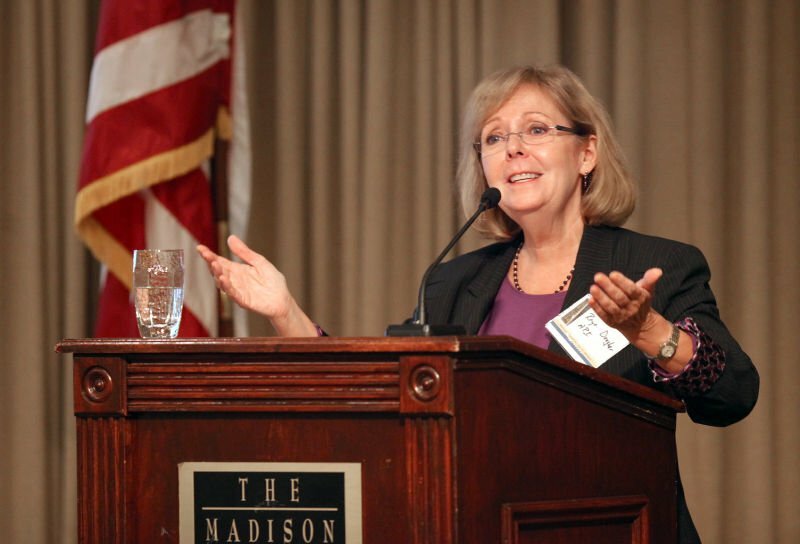 Rayola Dougher, senior economic advisor at the American Petroleum Institute, speaks at a Freight Rail conference Oct. 9. "I honestly think the sky is the limit for you guys" when it comes to frac sand mining, she said. Gov. Scott Walker has a 49 percent approval rating among registered voters in Wisconsin, according to the latest Marquette University Law School poll, released Tuesday. In Wisconsin, frac sand is the new gold. And by most accounts, the rush is only beginning. The type of ancient, coarse-grained sand that form the hills and river bluffs of west central Wisconsin is now highly prized by the oil and gas industry. Used in a process called hydraulic fracturing, or “fracking,” the sand is mixed with water and chemicals, then injected at high pressure into shale rock formations, forcing out formerly difficult-to-extract deposits of oil and natural gas. Fracking is why the U.S. is now producing more of its own petroleum than ever before, moving from importing 60 percent of its oil in 2007 to just 33 percent today, including Canadian imports. More than 40 percent of the natural gas and 30 percent of the oil being produced in the U.S. today is coming via fracking, with those numbers expected to climb past 60 percent by 2020. For that reason -- and because Wisconsin has some of the best frac sand deposits in the world -- the state is suddenly center stage on the world energy scene, despite having no fossil fuels of its own. “Wisconsin is the global epicenter, and we’re just getting started,” said Richard Shearer, president and CEO of Superior Silica Sands, which is headquartered in Ft. Worth, Texas, but has significant mining operations in this state. Shearer was a featured speaker Wednesday at the 7th annual Wisconsin Freight Rail Day at Madison's Concourse Hotel, where frac sand was the major topic of conversation. Rail is the least expensive way to move large quantities of sand from Wisconsin to drilling sites in North Dakota, Pennsylvania, Texas and beyond. In fact, transporting sand now makes up some 10 percent of the total volume moved by the Canadian Pacific railway, which is also hoping to cash in on the Wisconsin sand boom. “It’s already contributing significant volume and we see the market only growing going forward,” said Murray Hamilton, managing director of sales for CP. Frac sand is a $1 billion industry in Wisconsin and all the experts in attendance Wednesday seemed to agree there is no end in sight. The question isn’t how much sand the oil industry can use but rather who can deliver the best sand for the lowest price. “I honestly think the sky is the limit for you guys,” said Rayola Dougher, senior economic advisor for the American Petroleum Institute. Dougher said the petroleum industry already accounts for 19,700 jobs in Wisconsin and predicted that could double by 2035. The significance of the event wasn’t lost on Gov. Scott Walker, who gave the luncheon speech before a full house at the Concourse. While Wisconsin does not have shale deposits like North Dakota, Walker noted that Wisconsin has an increasingly large role to play in domestic energy production via its sand industry. 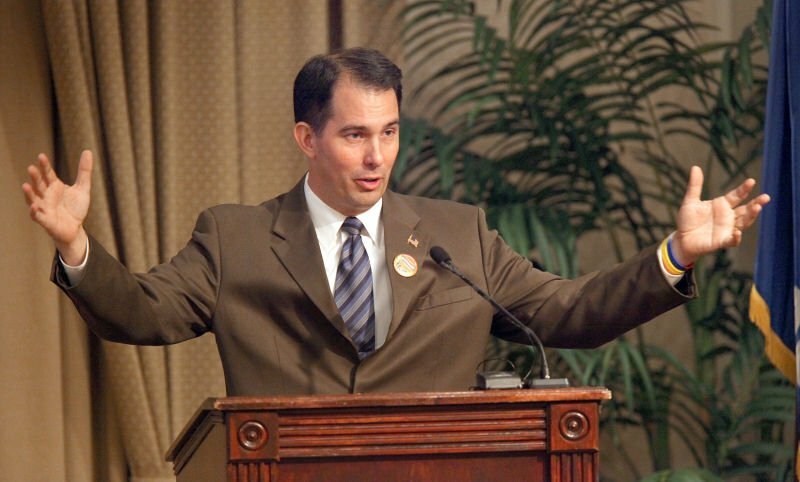 “I like to say thanks to God and the glaciers” for leaving behind the right kind of sand in Wisconsin, Walker told the receptive audience that included lobbyists, attorneys and rail officials. Walker’s 2013-15 budget includes two new positions within the Department of Natural Resources to help process applications for sand mining operations, along with investments in freight rail as part of a $6.4 billion package of transportation improvements. One issue for the sand industry has been the impact on local communities, including the blasting, truck traffic and dust. But Walker told reporters after the event that he believes frac sand mining can be done responsibly. Shearer of Superior Silica Sands is thinking even bigger. His company has recently invested nearly $100 million in Wisconsin, including new mines near Clinton and New Auburn. As global demand for frac sand grows, Shearer said he can see a day when Wisconsin sand is exported to South America or even China. “Despite what you might have read, this can be done right,” he said. "We see it as a long haul opportunity." Editor's note: This article has been updated to give more accurate estimates of the percentage of oil and natural gas produced with fracking in the U.S.
Mike Ivey has been a reporter with The Capital Times for more than 25 years, covering business, the environment and politics. He was named the state's top business reporter in 2011 by the Wisconsin Newspaper Association. Bruce Bittles tells a Madison Club gathering that 2015 should bring better news for investors.